Our address is 8626 Lee Hwy, Fairfax, VA 22031 We are located on the 2nd floor of a two story, brick office building with a half-moon window visible from Lee Highway. The largest sign is a green sign for Michael Nash Custom Kitchens, located in the same building. 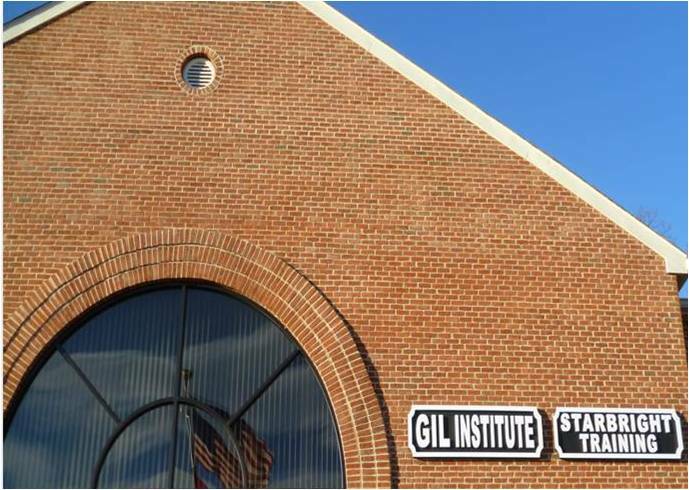 Look for the Gil Institute sign posted on the outside of the building. There is a large parking lot available for client parking. Cedar Lane is the closest cross-street, visible from the parking lot. Please note some GPS's will re-route to "Old Lee Highway." That is incorrect and can cause delays. From I-66, exit 62 (243-S), take ramp right for Nutley Street South. Get into the left lane for a left at the intersection of Nutley and Lee Highway. Travel approximately 1 mile. Gil Institute is on the left (just past Cedar Lane/Nutley intersection). Large parking lot, two story, brick office building with half-moon window and sign for Michael Nash Custom Kitchens. Gil Institute is also easily accessible by Route 50, US 29, and 495. Accessible by bus transportation / Fairfax Connector Route 462: Vienna – Park Street. Our office hours are extended to accommodate work and school schedules. We work with clients to find a time that is possible for both client and clinician. Typically, our after-school hours begin at 3PM until our last appointments at 7PM. Clinicians are available as early as 9AM Monday-Friday. Some of our staff also work on Saturdays to accommodate client schedules and to provide additional options to working parents. Our schedule on Saturday is 9AM – 6PM. trauma-focused treatment to children, adolescents, and adults.